The Spotify Lite beta app with data cap features is now available in Malaysia for Android only. Spotify Lite is currently in beta and is aimed at developing countries where data usage is at a premium. The beta app features many the same features Spotify Premium like playlists, favorites, music discovery, and recommendations. However, it does not support podcasts, fline music, high-quality streaming, or . Spotify Lite is designed to use the least amount mobile data possible while streaming music. 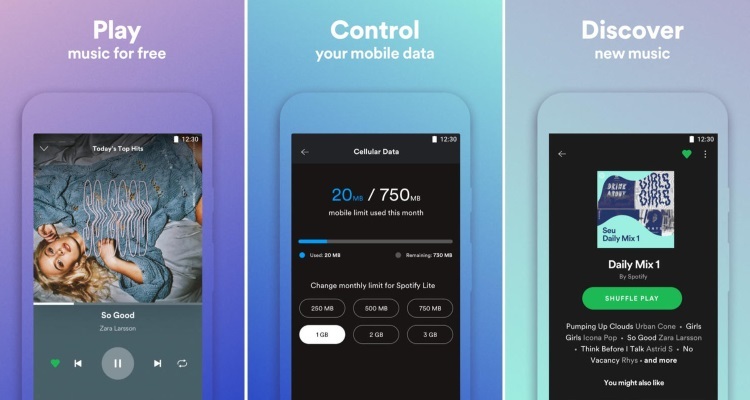 The app gives users the setting to set the monthly Spotify Lite data cap inside the app. Users can choose between 250MB, 500MB, 750MB, 1GB, 2GB, or 3GB data usage per month. This feature is essential in most Asia, where data usage can be a premium charge. Spotify Lite launched last year on the Google Play Store for users in Brazil, Mexico, and Indonesia. The expansion into Malaysia brings Spotify into another target market where music streaming may not be suitable for most users if data caps can’t be utilized. The regular Spotify app is ~100MB to download install, while Spotify Lite clocks in at just under 15MB. Spotify Lite launched over 10 months ago with no support for fline playback, which seems odd. The app is designed to reduce data consumption by removing features, but it fers no way to download music for fline listening. It also severely limits the premium subscription options, too. Android Police got their hands on the Brazilian version the app and found that even members can’t select specific songs to play. Spotify Lite relies on the shuffle button, making it a glorified Pandora alternative. With so many premium features cut out, the Spotify Lite app only has value to free users who want to stream music. But given that this is a beta release, some improvements may be ahead.